In the hands of morgan94. Use TB2QA9W to reference this item. My mission is to follow (as closely as possible anyway!) the route chosen by Ewan McGregor and Charley Boorman in The Long Way Round, their documentary motorcycle trip around the world. I would like to visit London, Brussels, Prague, Kieve, Volgograd, Almaty, Alaan Baatar, Yakutsk, Magadan, Anchorage, White Horse, Calgary, Chicago, and New York and have my photo taken at each place. Everywhere I travel, I want to spread the word, LOOK TWICE FOR BIKES! 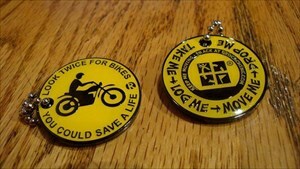 This coin is part of the Todie's Wild Ride bike safety and awareness race started by Rockin Roddy. On August 12, 2008, Tod Phillips, one third of Team Rod & Tod w/KAboom, was riding a motorcycle when he was killed in an accident caused by a driver who didn't see him. Tod was just 49 years old. I'm sorry to report that this was not seen in the Pease Gas Saver today. left in New Hampshire off I95! Oddly enough I found this lovely TB on my first day ever of bike caching. I think it was a sign from your friend! Will move along!